Greensleeves is a wonderful, passionate song from medieval times, that beginner guitarists will love learning how to play, since it’s fairly simple, but has a terrific melody. The popular Christmas song called What Child is This is also based on the melody of Greensleeves. The guitar lesson on Greensleeves (or What Child is This, whatever you like to call it) is split into 2 parts, since you’ll be learning arpeggiated chords at first, than the solo in the second half of the lesson. It is one of our unique beginner guitar lessons, since you’ll be able to record yourself playing either of the parts, and use it as a backing track while you play the other part of the song! 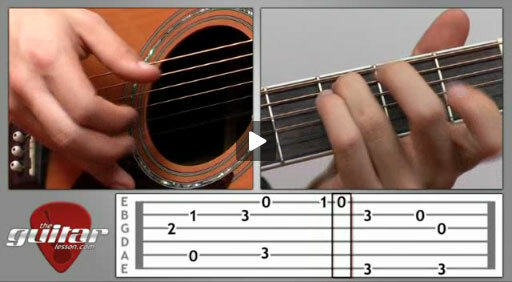 In the first part of the lesson, you’ll be using finger picking to play the main melody of the song. You’ll learn about using bass and treble notes complementing each other, which will improve your musical ear and your picking hand coordination. In the second half of the lesson, you’ll be learning chords you’ll need to play the arpeggiated backing melody to the song. This gives you a great opportunity to practice arpeggios and chord changes, so practice it a lot, it’ll really be worth your while. In conclusion, learning how to play Greensleeves is recommended mainly for beginner guitarists who are looking to play a great romanesca classic and at the same time practice finger picking, chords and bass-treble line guitar. This is a long lesson as it covers a lot of material, so don’t feel like you have to get through it in one go. Greensleeves is a traditional English folk song in romanesca style. The song can be found in sources dating back to the 16th century, however, its origin in uncertain. Greensleeves is in Dorian mode, though modern musicians sometimes play it in the natural minor scale instead. Sorry, but you've reached a premium content area. The download of the Greensleeves tablature file is only available to premium members. Sorry, the same goes for the backing track. To download the backing track to Greensleeves, please log in and revisit this page.